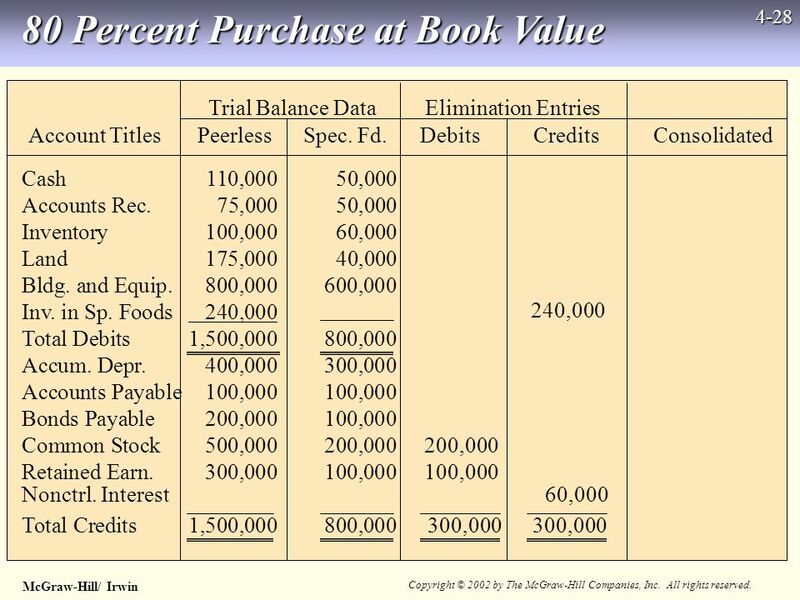 McGraw-Hill/ Irwin Copyright © 2002 by The McGraw-Hill Companies, Inc. All rights reserved. 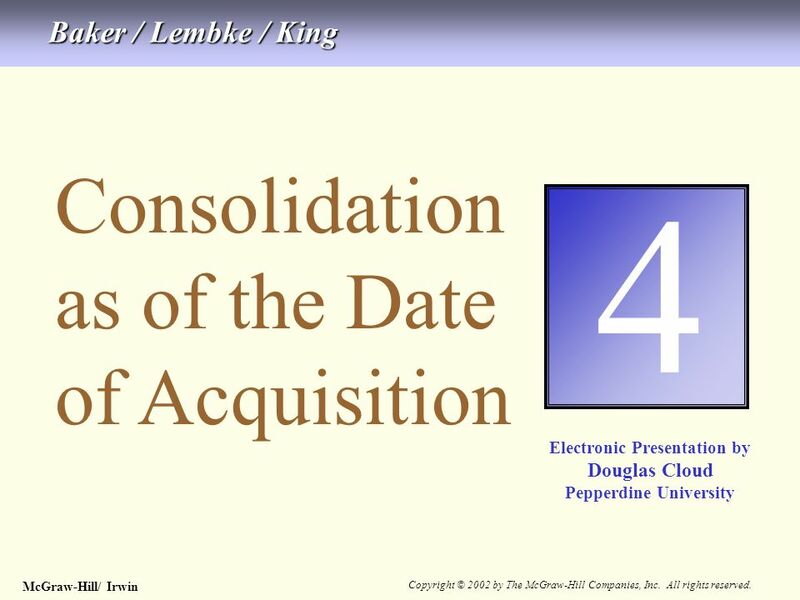 4-1 Consolidation as of the Date of Acquisition 4 Electronic. 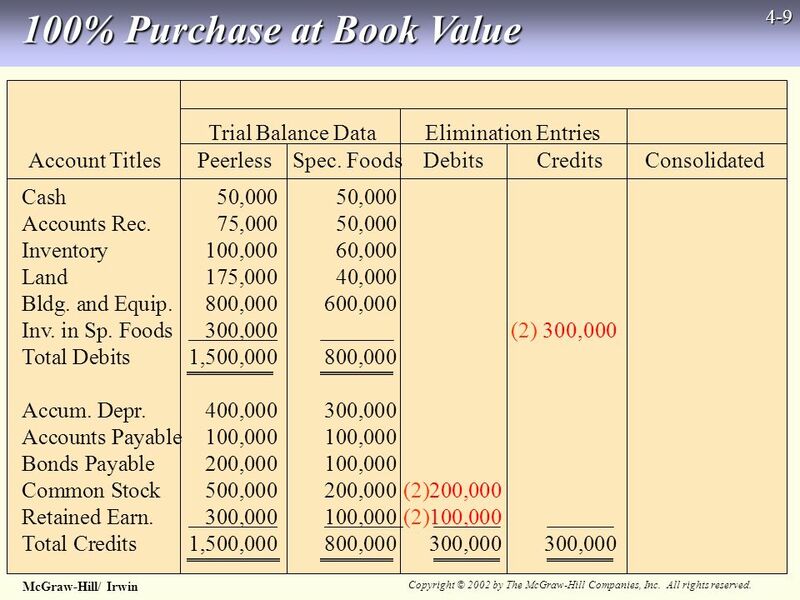 3 McGraw-Hill/ Irwin Copyright © 2002 by The McGraw-Hill Companies, Inc. All rights reserved. 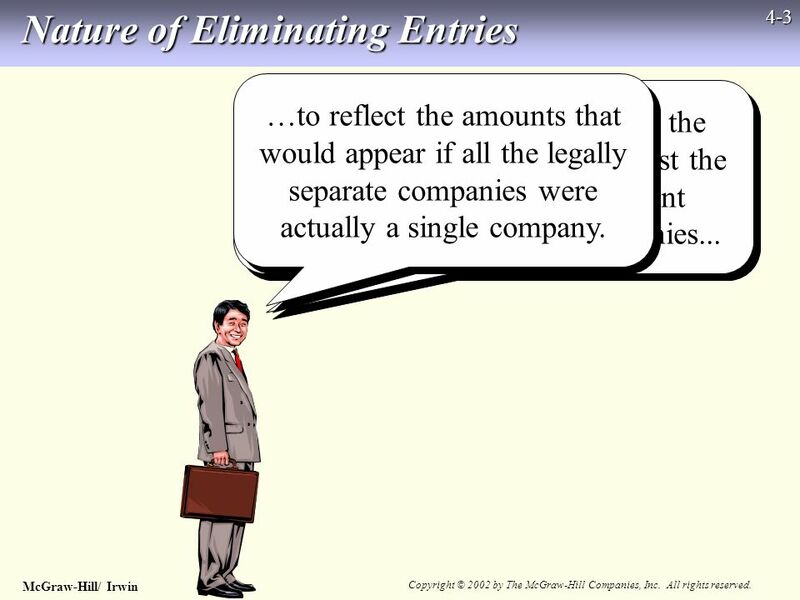 4-3 Nature of Eliminating Entries Eliminating entries are used in the consolidation workpaper to adjust the totals of the individual account balances of the separate companies... …to reflect the amounts that would appear if all the legally separate companies were actually a single company. 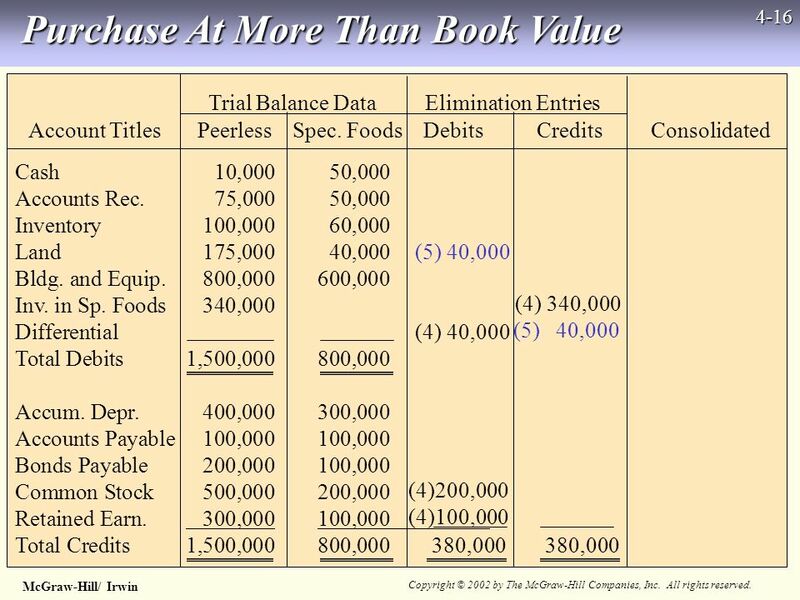 4 McGraw-Hill/ Irwin Copyright © 2002 by The McGraw-Hill Companies, Inc. All rights reserved. 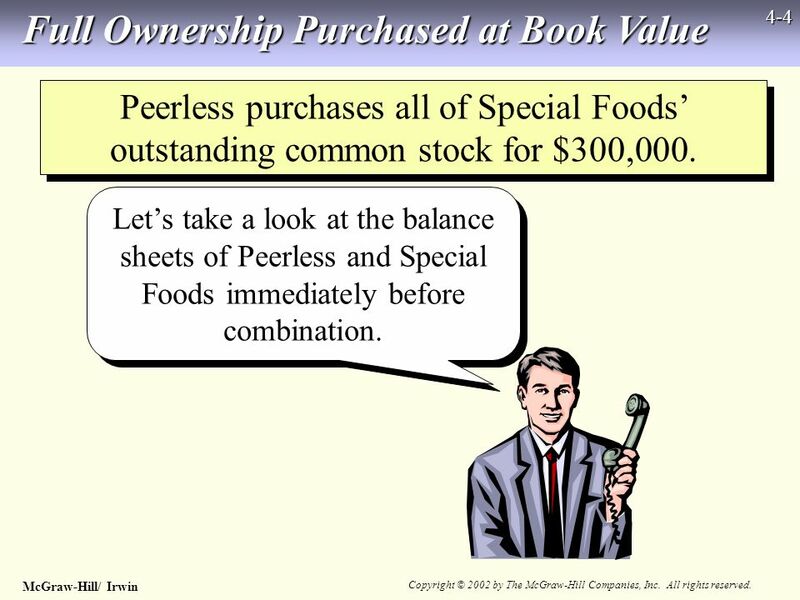 4-4 Full Ownership Purchased at Book Value Peerless purchases all of Special Foods outstanding common stock for $300,000. 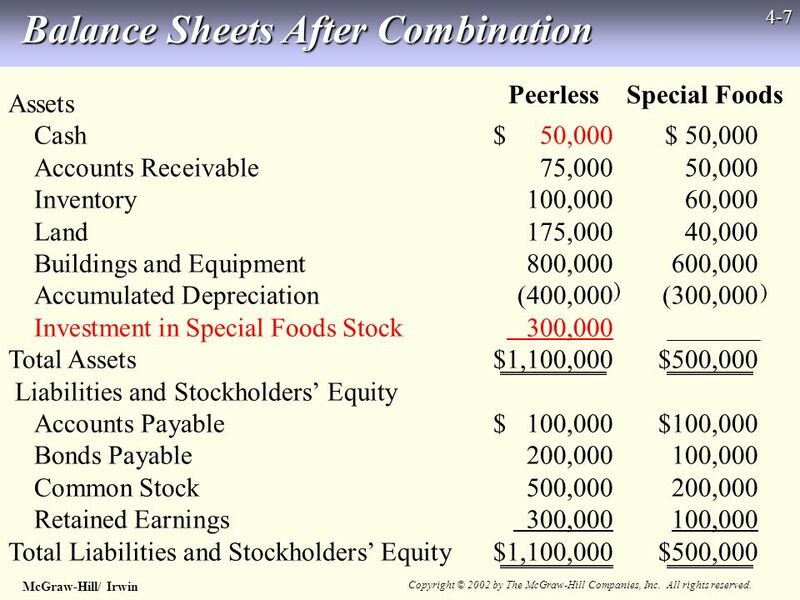 Lets take a look at the balance sheets of Peerless and Special Foods immediately before combination. 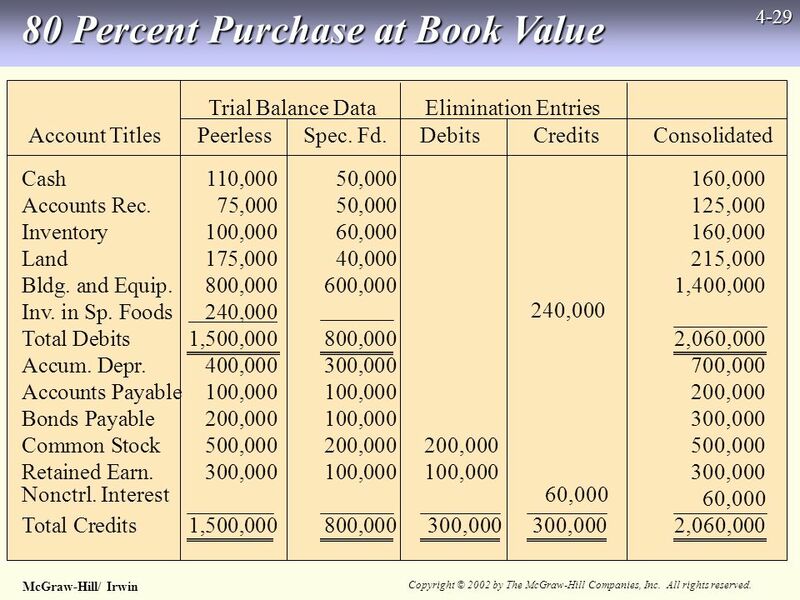 19 McGraw-Hill/ Irwin Copyright © 2002 by The McGraw-Hill Companies, Inc. All rights reserved. 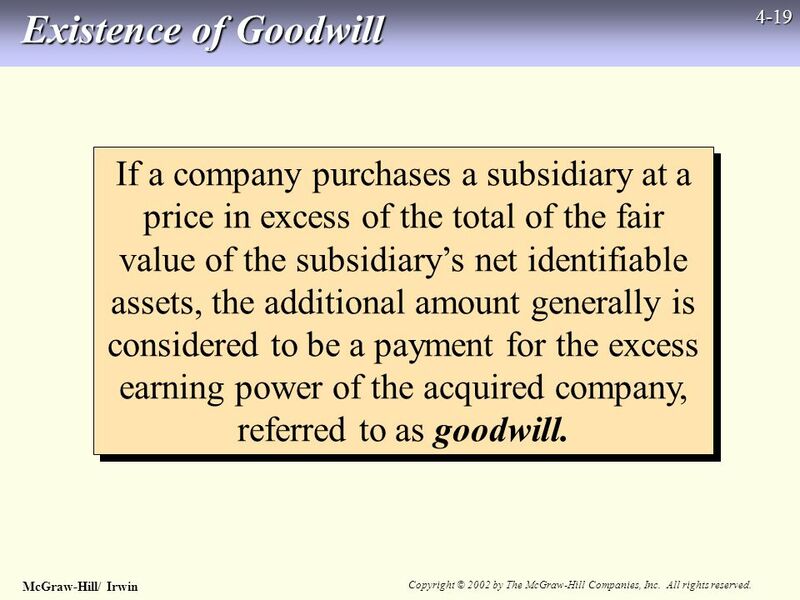 4-19 Existence of Goodwill If a company purchases a subsidiary at a price in excess of the total of the fair value of the subsidiarys net identifiable assets, the additional amount generally is considered to be a payment for the excess earning power of the acquired company, referred to as goodwill. 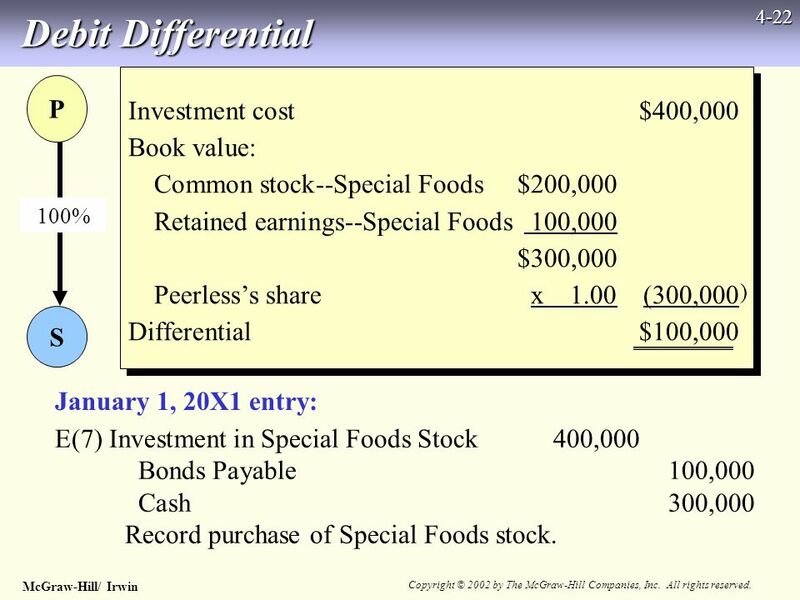 20 McGraw-Hill/ Irwin Copyright © 2002 by The McGraw-Hill Companies, Inc. All rights reserved. 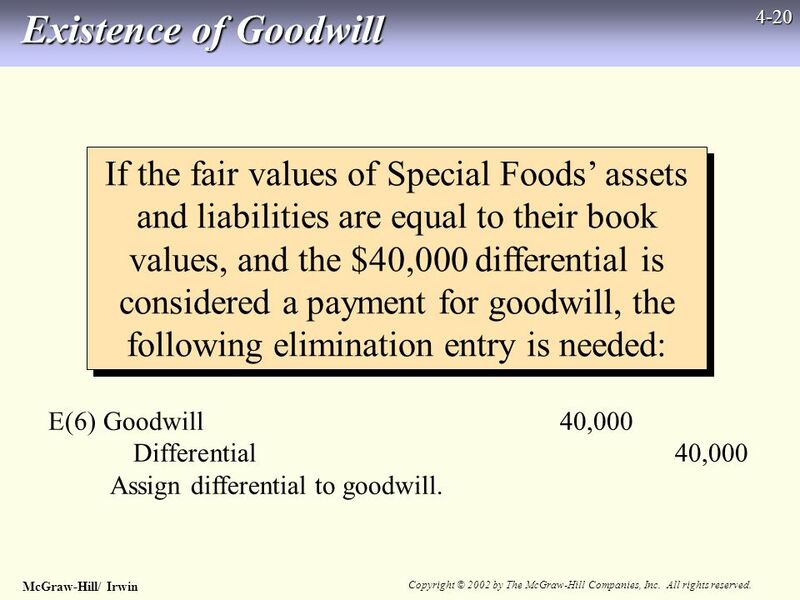 4-20 Existence of Goodwill If the fair values of Special Foods assets and liabilities are equal to their book values, and the $40,000 differential is considered a payment for goodwill, the following elimination entry is needed: E(6) Goodwill40,000 Differential40,000 Assign differential to goodwill. 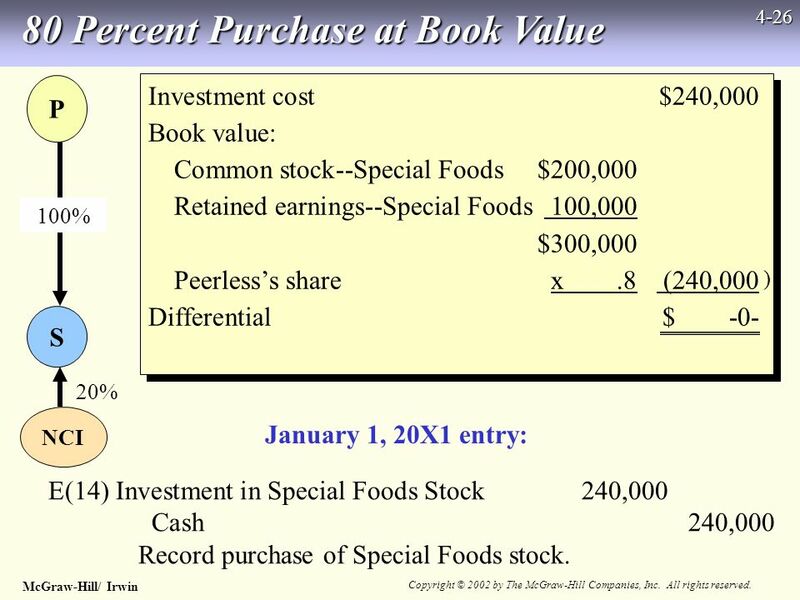 21 McGraw-Hill/ Irwin Copyright © 2002 by The McGraw-Hill Companies, Inc. All rights reserved. 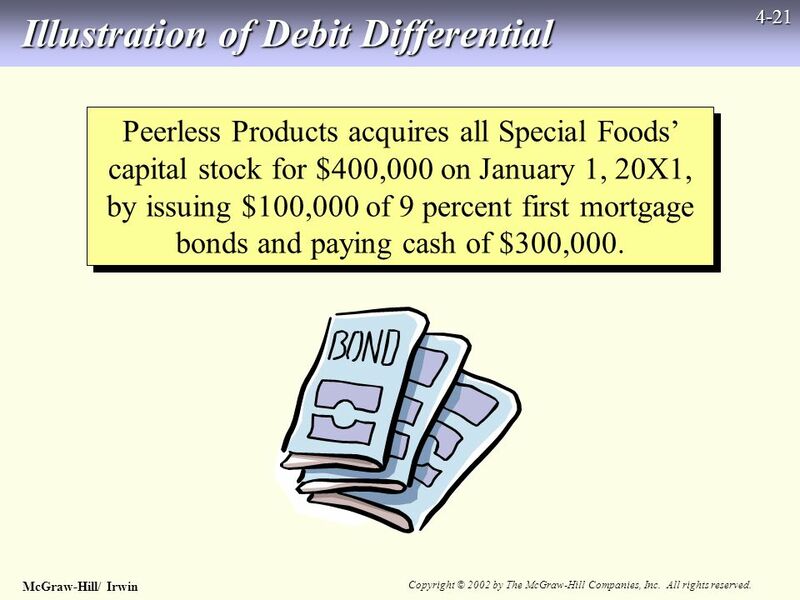 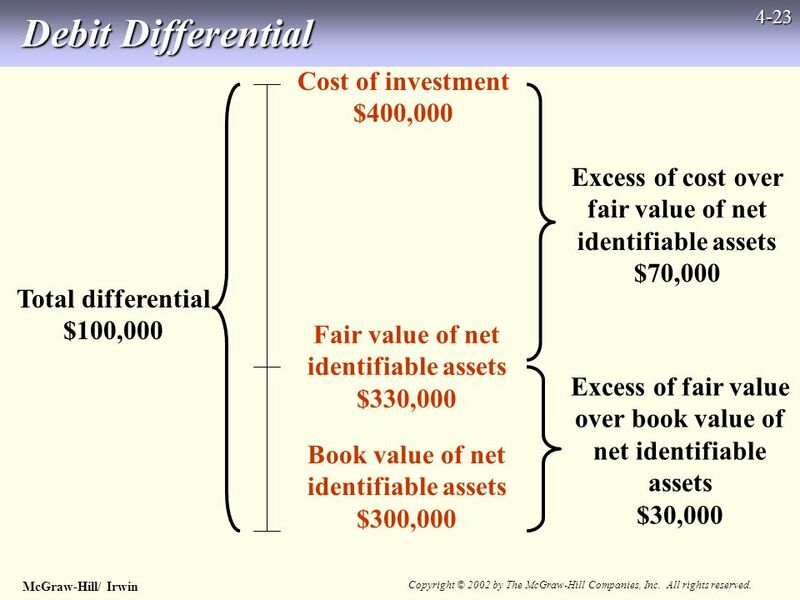 4-21 Illustration of Debit Differential Peerless Products acquires all Special Foods capital stock for $400,000 on January 1, 20X1, by issuing $100,000 of 9 percent first mortgage bonds and paying cash of $300,000. 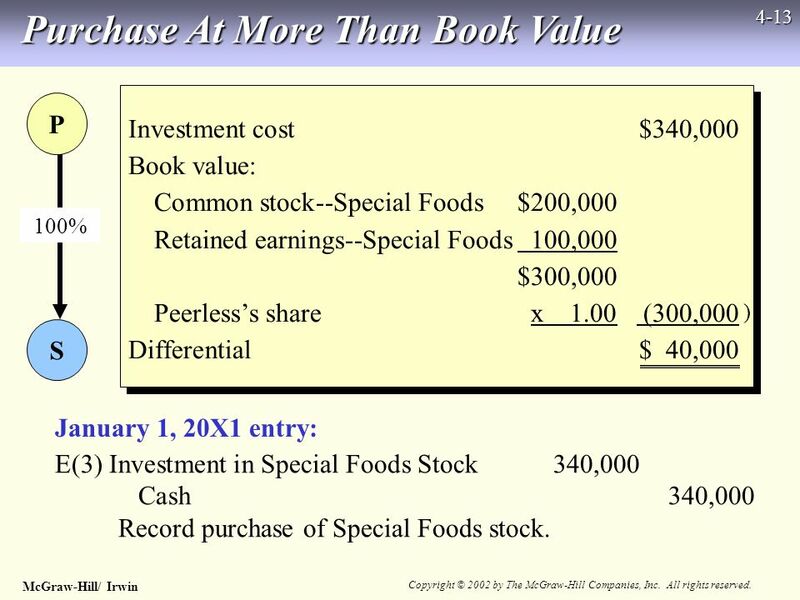 24 McGraw-Hill/ Irwin Copyright © 2002 by The McGraw-Hill Companies, Inc. All rights reserved. 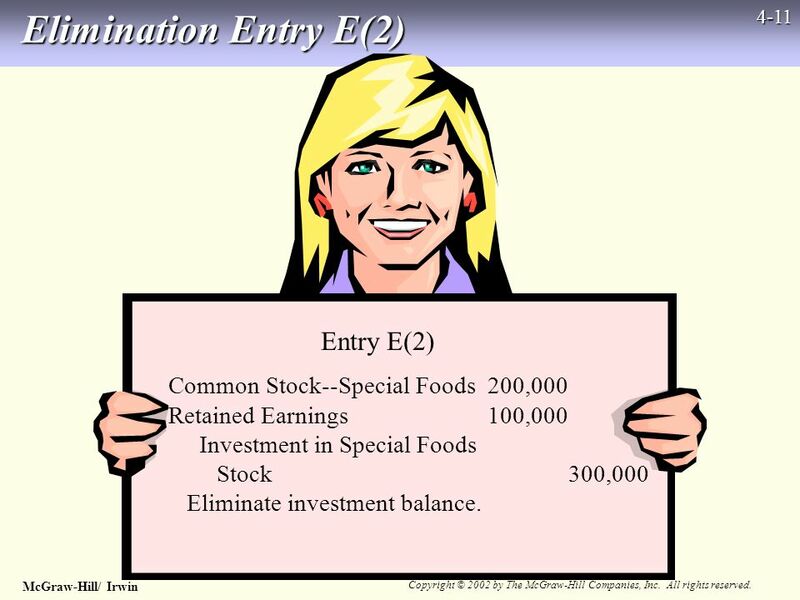 4-24 Debit Differential The eliminations entered in the consolidation workpaper in preparing the consolidated balance sheet immediately after the combination are: E(8) Common Stock--Special Foods200,000 Retained Earnings100,000 Differential100,000 Investment in Special Foods Stock400,000 Eliminate investment balance. 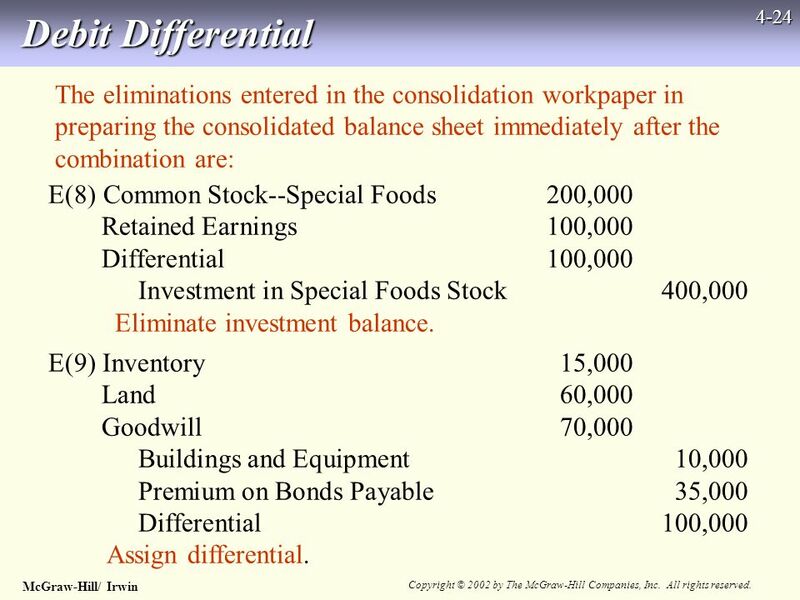 E(9) Inventory15,000 Land60,000 Goodwill70,000 Buildings and Equipment10,000 Premium on Bonds Payable35,000 Differential100,000 Assign differential. 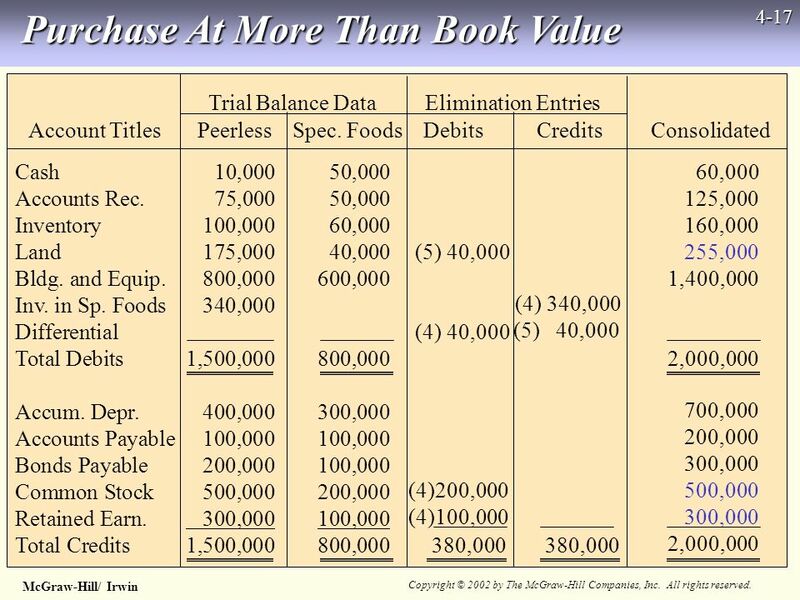 25 McGraw-Hill/ Irwin Copyright © 2002 by The McGraw-Hill Companies, Inc. All rights reserved. 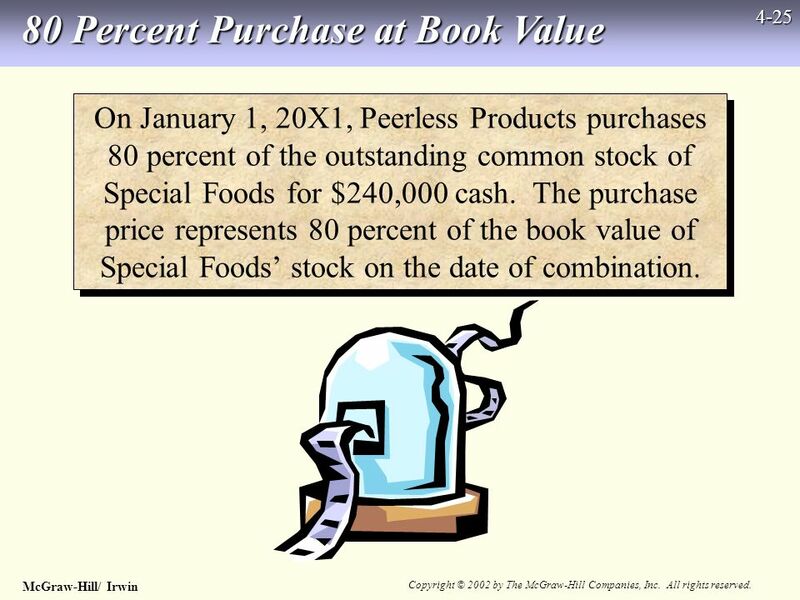 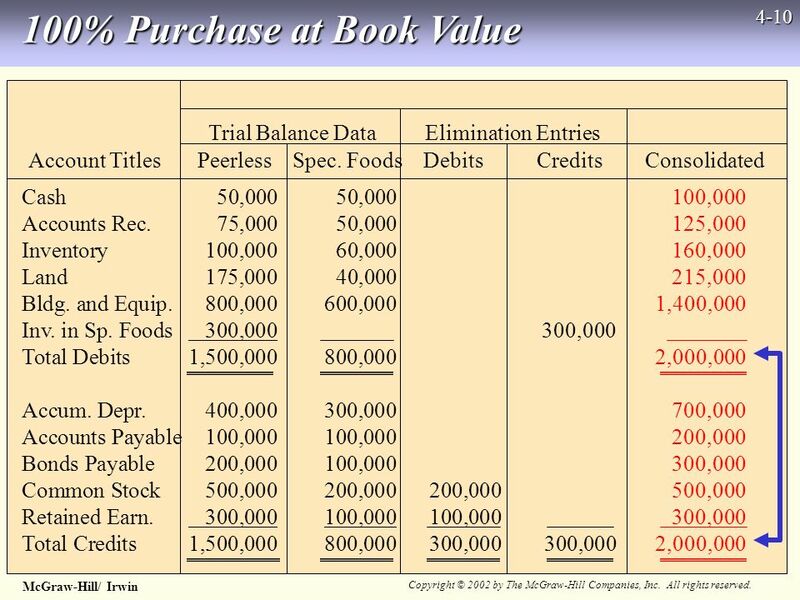 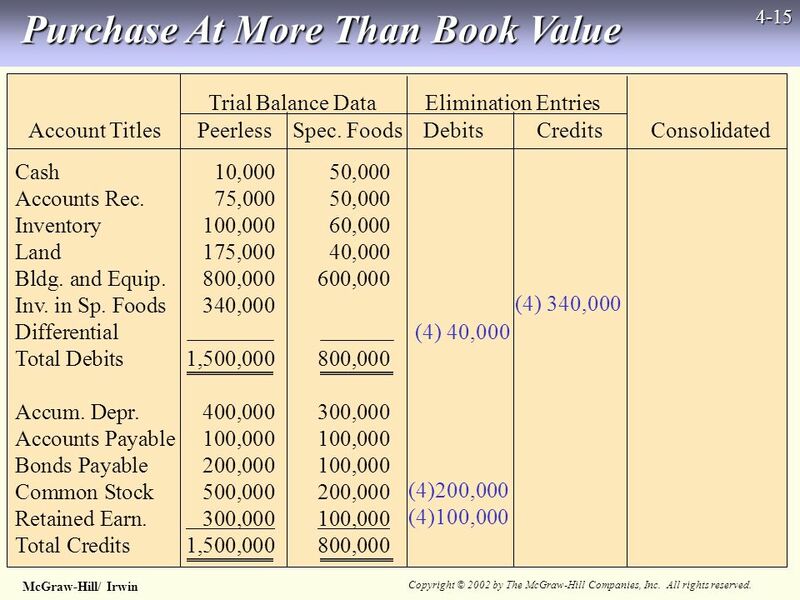 4-25 80 Percent Purchase at Book Value On January 1, 20X1, Peerless Products purchases 80 percent of the outstanding common stock of Special Foods for $240,000 cash. 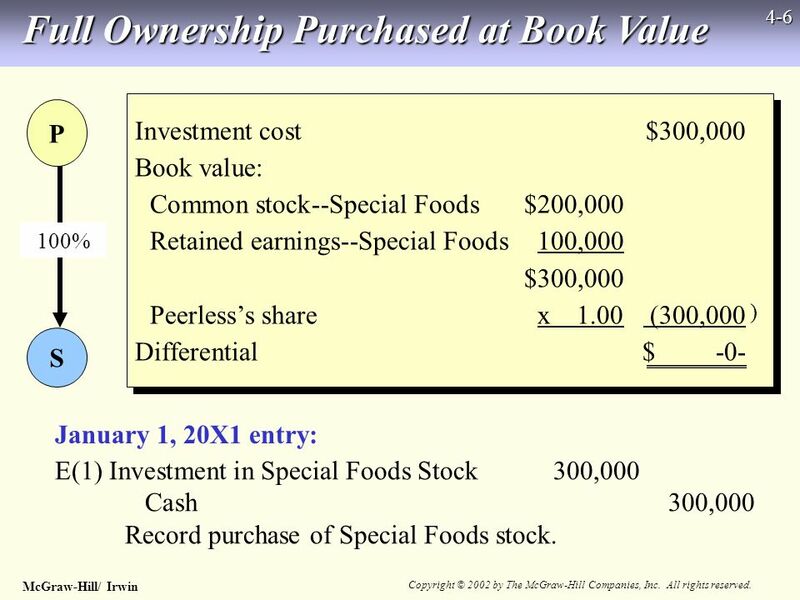 The purchase price represents 80 percent of the book value of Special Foods stock on the date of combination. 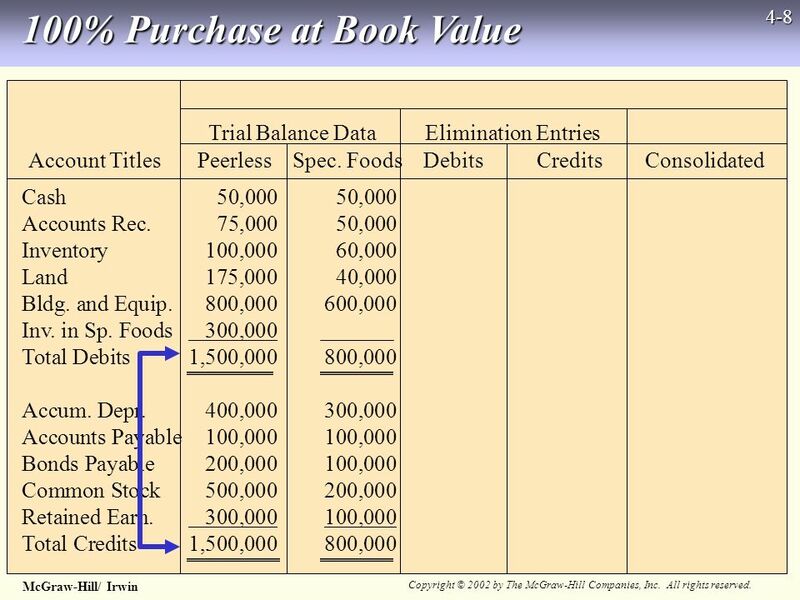 Download ppt "McGraw-Hill/ Irwin Copyright © 2002 by The McGraw-Hill Companies, Inc. All rights reserved. 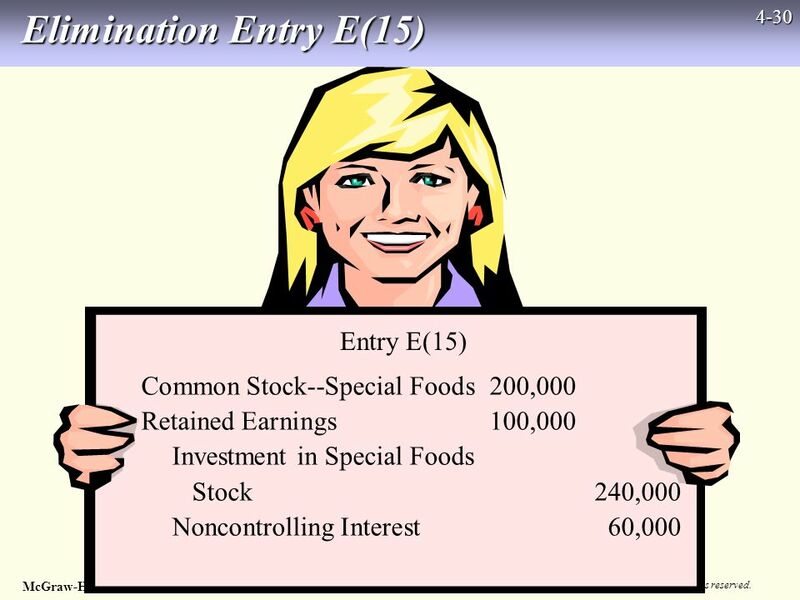 4-1 Consolidation as of the Date of Acquisition 4 Electronic." 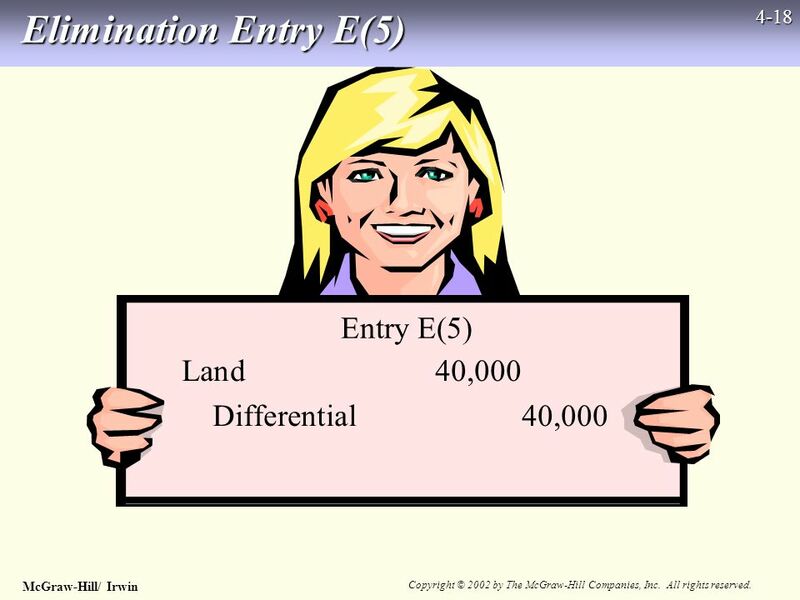 ACCOUNTING JEOPARDY ACCOUNTING REVIEW DOCSEDA. 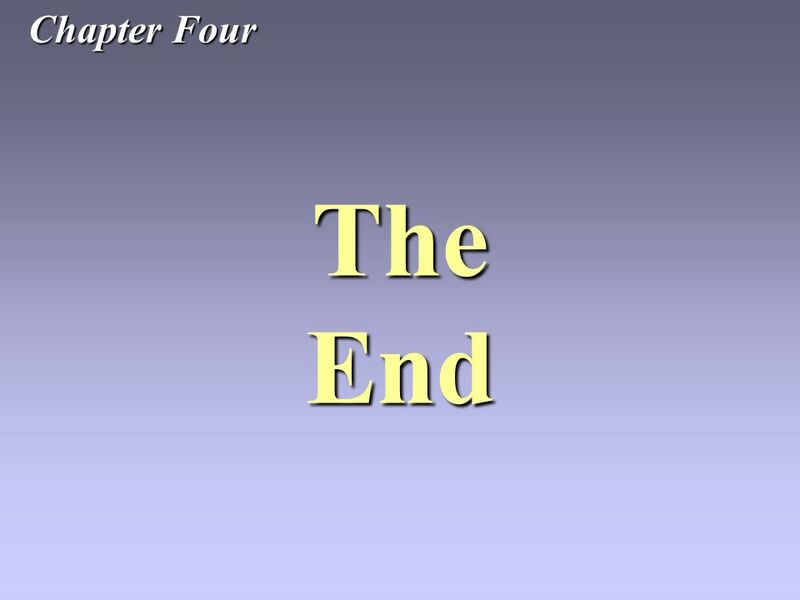 Electronic Presentations in Microsoft ® PowerPoint ® Prepared by Peter Secord Saint Marys University © 2003 McGraw-Hill Ryerson Limited. 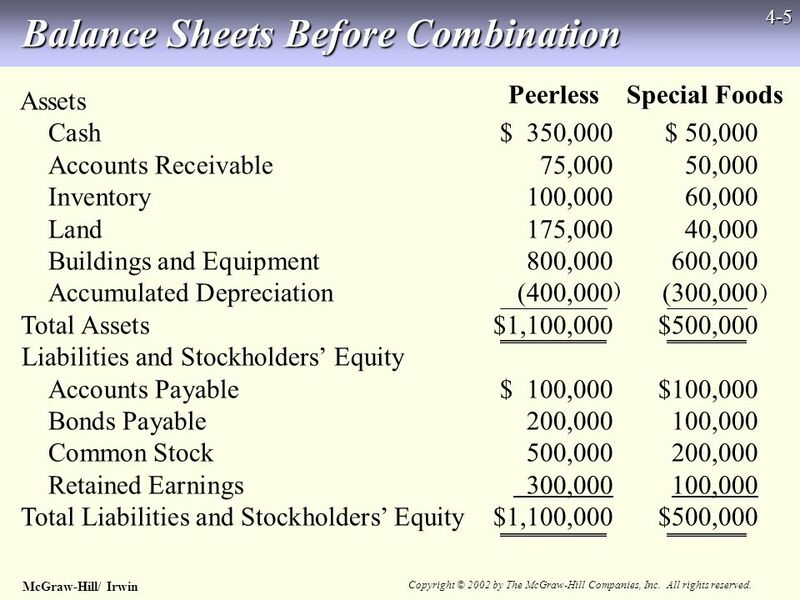 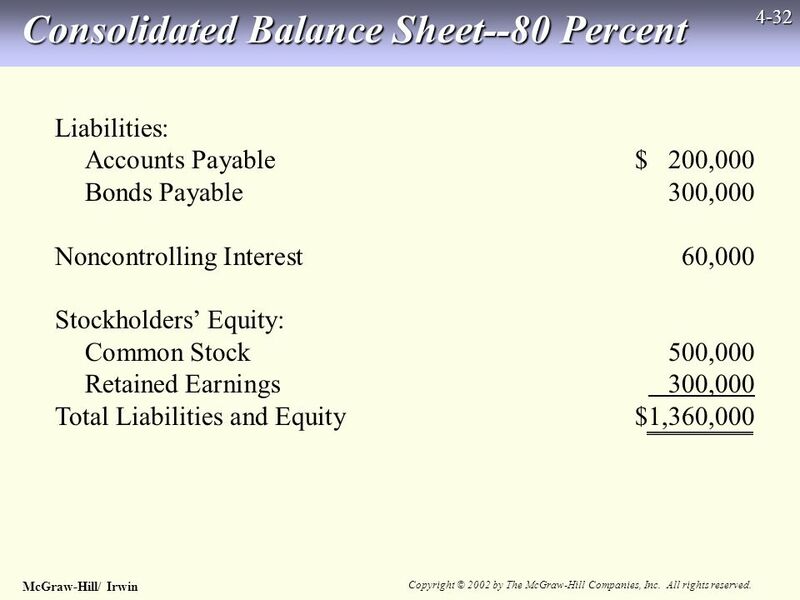 Financial Accounting John J. 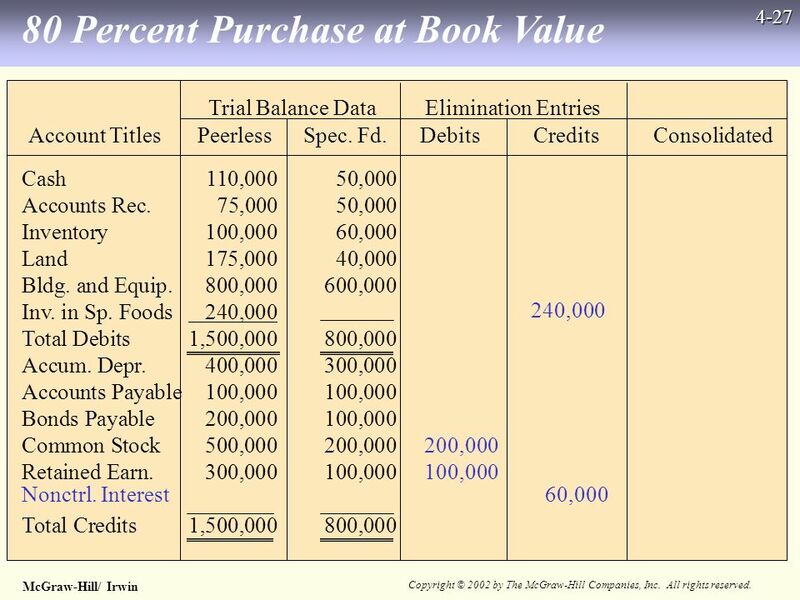 Wild Sixth Edition John J. 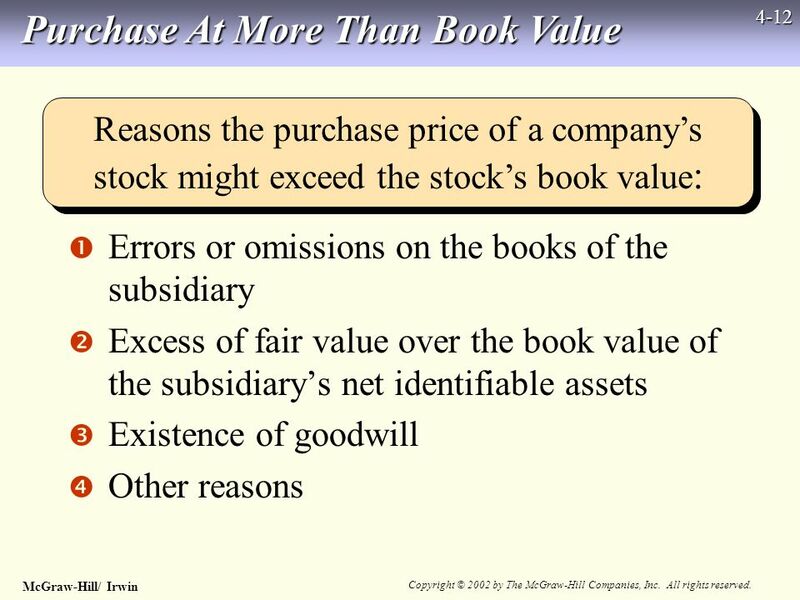 Wild Sixth Edition Copyright © 2013 by The McGraw-Hill Companies, Inc. All rights reserved.McGraw-Hill/Irwin. 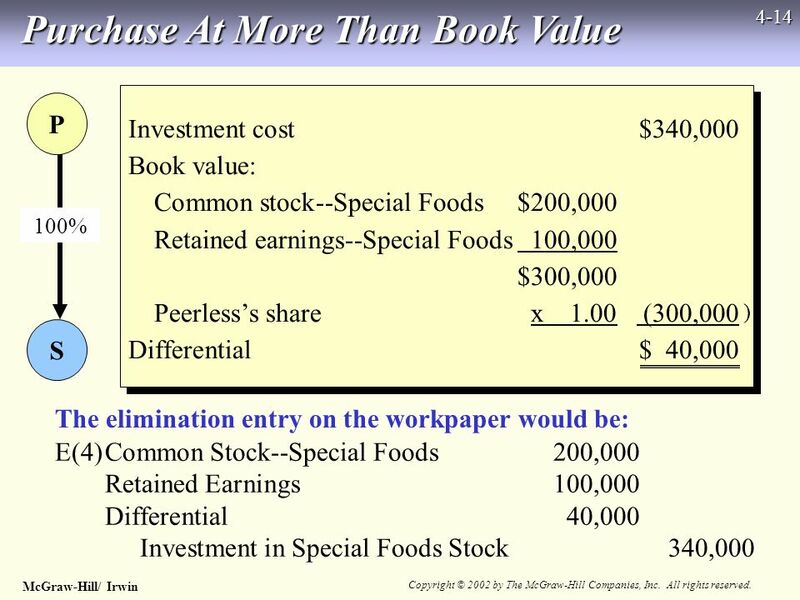 McGraw-Hill/Irwin© 2008 The McGraw-Hill Companies, Inc. All rights reserved. 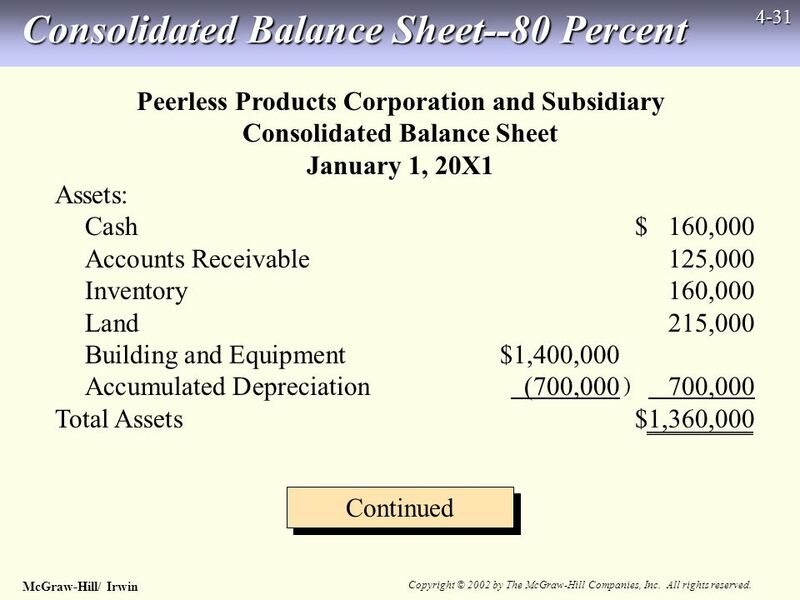 3 The Reporting Entity and Consolidated Financial Statements.